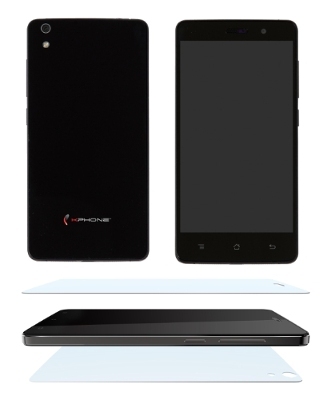 KPHONE K5 unlocked Android smartphone with 5" display, Android 5.0, quad-core processor, dual cameras, and more. KPHONE Launches with High-End Unlocked Android Smartphone, the K5 -- Feature-Rich Unlocked Smartphone Features Qualcomm Quad-core Snapdragon Processor, Corning Gorilla Glass, Dual-SIM Cards and much more. "With the growth of 'bring-your-own-device' plans from cellphones carriers, KPHONE's first smartphone, the K5, is uniquely positioned to quickly become a leader in the unlocked smartphone market," commented Scott Robbins, VP of Sales, Retail Channels. "Being one of the largest cellphone manufacturers in China means that the team at KPHONE understands what it takes to succeed in this competitive market: great design, high-quality products, strong manufacturing capabilities and a focus on your customers." The K5 unlocked smartphone allows consumers to manage and simplify their lives. Whether sharing photos on their favorite social network, surfing the Internet or visiting international destinations, it is a must-have for any user. With the Google Play store a touch away, users can access their favorite apps, games, music, books, movies and more, as well as sync content between all their devices using standard Google apps. The K5 comes with an advanced Qualcomm quad-core Snapdragon 410 MSM8916 processor designed for high-volume mainstream applications, and provides a powerful combination of features, performance, and battery efficiency. It runs on the powerful Android 5.0 Lollipop operating system. Its 5" high-definition (1280 x 720) IPS display provides sharp images and supports full 1080p video, while a GFF 10-point touchscreen makes operating a snap. The unlocked K5 comes with a Lithium-Ion 2920 mAh battery with quick-charge capability, providing plenty of power to talk, text, or surf the web. The new K5 unlocked smartphone from KPHONE will be available at an aggressive price in October 2015. 0 comments on "KPHONE K5 High-End Unlocked Android Smartphone"